Rep. Steny Hoyer of Maryland, one of the leading Democrats in the House of Representatives, recently demonstrated why liberals' eagerness to vilify opponents has alienated so many Americans, pushing them toward Donald Trump. Hoyer provided a case study for the argument of University of Virginia political scientist Gerard Alexander that "a backlash against liberals — a backlash that most liberals don't seem to realize they're causing — is going to get President Trump re-elected." Hoyer called on Francis Cissna, head of U.S. Citizenship and Immigration Services, to cancel an interview scheduled at the National Press Club with Jessica Vaughan, director of policy studies at the Center for Immigration Studies. Noting that the Southern Poverty Law Center had designated CIS as a "hate group", he said Cissna's agency "should not be tainted by your address to this hate group." The interview went ahead as scheduled. (The video and transcript are here.) 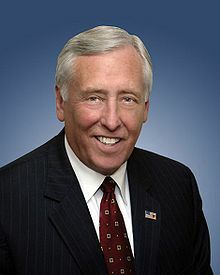 But Hoyer's publicity stunt proved his determination to placate critics who claim that the 79-year-old minority whip is too old and tired to provide the aggressive leadership the party requires. Minority Leader Nancy Pelosi is receiving the same criticism. If Democrats are serious about taking back the White House, they should study Professor Alexander's essay in the New York Times. "Liberals can act as if they're not so certain — and maybe actually not be so certain — that bigotry motivates people who disagree with them on issues like immigration," he wrote. "Without sacrificing their principles, liberals can come across as more respectful of others. Self-righteousness is rarely attractive, and even more rarely rewarded." That's the sort of politically astute counsel that liberals who take their social justice cues from the Southern Poverty Law Center are sure to ignore. The SPLC has been richly rewarded for weaponizing self-righteousness with its ongoing post-2016-election fundraising campaign. By spreading the "hate group" smear beyond such worthy targets as the Ku Klux Klan and Nazi skinheads to such widely respected organizations as the Family Research Council and the Center for Immigration Studies, the SPLC has cashed in. It has incorporated reckless character assassination and smear into its business plan. It has taken cynical hate-mongering and dressed it up as righteous conviction. It has set out to stifle public discussion by delegitimizing ideological foes. Media accounts have marveled at the haul. The Weekly Standard reported that in the 2017 fiscal year the SPLC endowment grew by more than $180 million, reaching nearly $500 million. In June, Marc A. Thiessen, a conservative columnist for the Washington Post, wrote that the SPLC "has become a caricature of itself, labeling virtually anyone who does not fall in line with its left-wing ideology as an "extremist" or "hate group". Last year, Politico's Ben Schreckinger asked: "Is tough immigration control really a form of hate, or just part of the political conversation? ... At a time when the line between 'hate group' and mainstream politics is getting thinner and thinner and the need for productive civil discourse is growing more serious, fanning liberal fears, while a great opportunity for the SPLC, might be a problem for the nation."